Land Rover has unveiled its long-awaited Range Rover Evoque Convertible - bringing open-top motoring to the luxury SUV market for the first time. The drop-top version of Land Rover’s best-selling vehicle becomes the fifth member of the Range Rover family. 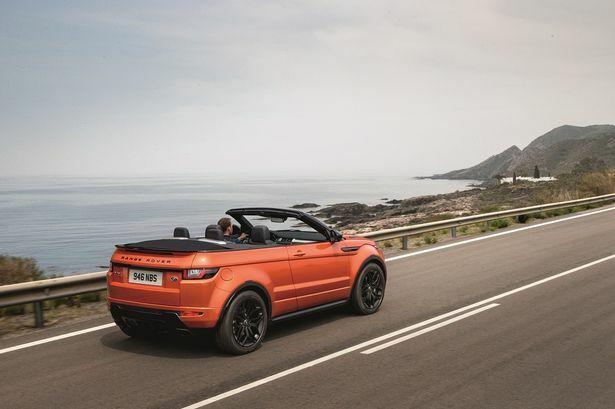 Land Rover’s design supremo Gerry McGovern said: “Range Rover Evoque Convertible is a vehicle for all seasons. The success of the Evoque, launched in 2012, has been one of the cornerstones of Jaguar Land Rover’s success in recent years. In the UK alone it sells around 40,000 a year and with the global SUV market expected to grow by 20 per cent over the next five years Jaguar Land Rover believes another Evoque derivative can help it claim more than its fair share of that. The new model will be produced at Land Rover’s Halewood plant, which already produces Evoque five-door and coupé bodystyles, as well as the Land Rover Discovery Sport. It will go on sale in spring 2016, with UK prices starting from £47,500. That will be for a TD4 HSE Dynamic model fitted with Jaguar Land Rover’s 2.0-litre Ingenium engine produced at the car maker’s engine factory near Wolverhampton. It promises low running costs, delivering fuel economy of up to 55mpg and emitting just 149g/km of CO2. The Evoque Convertible will be available with Land Rover’s full suite of lightweight, all-aluminium four-cylinder petrol and diesel engines, including a potent 240PS Si4 petrol. It features a fully-automated fabric roof which can fold away in 18 seconds and can be raised in 21 seconds, at speeds up to 30mph. Loadspace in the four-seater remains generous with a 251-litre boot. The cabin features an all-new, high-resolution 10.2-inch touchscreen with Jaguar Land Rover’s next-generation infotainment system, InControl Touch Pro, which offers smartphone integration, navigation, 3G connectivity and a premium sound system. Safety features include a special Roll-Over Protection Device featuring deployable roll-over bars hidden in the rear bodywork. It deploys two aluminium bars within 90 milliseconds in the unlikely event of a roll-over situation to create a survival space for occupants. The Evoque convertible will also offer Land Rover’s famed all-terrain capability, using the same technologies available on Evoque five-door and coupé derivatives. It will offer a choice of four-wheel drive powertrains combined with Land Rover’s nine-speed automatic transmission, Terrain Response system, Wade Sensing and All-Terrain Progress Control. The Evoque Conterbile will be shown in public for the first time at the LA Auto Show on November 20.